LAS VEGAS —French manufacturer SuperTooth announced a new and inexpensive multi-room audio system based on the Bluetooth protocol. 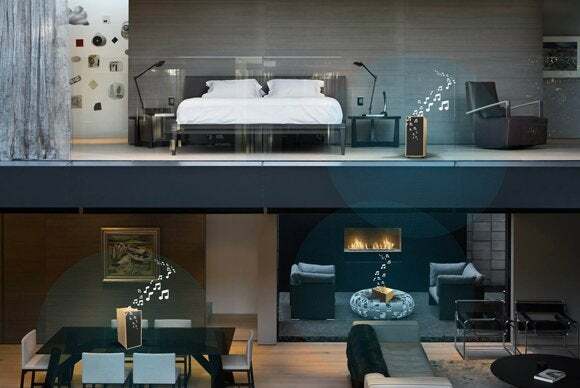 The system includes up to five total speakers, each of which can be placed in different locations around the home, allowing for an uninterrupted transition of audio content when moving from room to room. The speaker system connects to SuperTooth’s free multi-room app, from which a user can control both total system volume and which speakers are set to mono versus stereo. A multi-room speaker system can be a great audio solution for both social gatherings and individual use. The company plans to offer the all-in-one system at a relatively affordable price. The Bluetooth connection opens up a large amount of streamable content from devices like computers, tablets and smartphones, including music from apps like Spotify, Pandora and YouTube, as well as the owner’s music library. By using Bluetooth, customers can take advantage of easy-to-use interfaces that already exist through mobile and computer apps instead of having to struggle with a complicated speaker system. SuperTooth’s multi-room speaker system, then, is designed to be a painless way to stream and listen to audio content. Why this matters: Sonos currently dominates the multi-room audio market and has proven to be a very tough competitor. But the least-expensive Sonos speaker, the Play:1, is priced at $199. Building a three-speaker system using SuperTooth speakers would cost half as much. The key question, however, is whether it will sound as good or be as flexible as a Sonos system. We’ll get one in for review as soon as we can to answer that. This story, "SuperTooth debuts super-cheap multi-room speaker system at 2015 CES" was originally published by TechHive.